If the weather has you trapped inside, have no fear, have no fear! I know some new tricks, a lot of good tricks, I will show them to you. Your mother will not mind at all if I do. 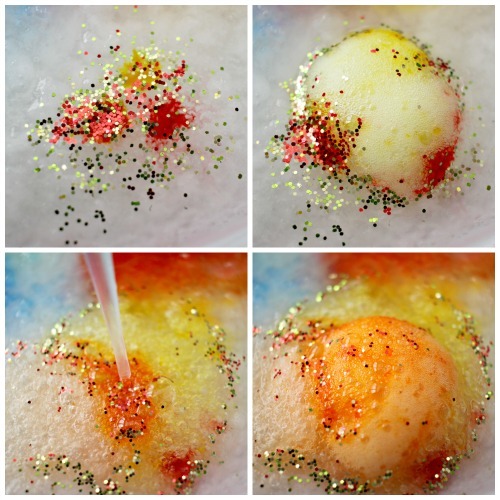 These tricks involve creating incredible process art using a classic chemical reaction. Grab some Insta-Snow Powder, some baking soda, and some vinegar and get ready for an afternoon of fun even The Cat in the Hat would be envious of. The first step is to whip up a batch of wet squishy fake snow. 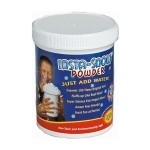 To do this either mix up Insta-Snow Powder according to the manufacturer’s directions or grab a clean diaper and follow the instructions I outlined in my post about making Fake Snow. Both of these products are made of sodium polyacrylate and you get the same squishy, white, beautiful snow-like gel from both of them. Be sure to contain the fake snow in some kind of a plastic bin or baking sheet for easy clean up! Play in the fake snow for awhile. It is such a unique sensory experience to squish it between clenched fingers and roll it between outstretched palms . Grab some kitchen tools and let the kids dig, cut, mold, and shape it. Once everyone is done playing with the fake snow transform it into fizzy snow. Pipettes – These are cheap. ($3-$5 for 100 of them!) They are also so useful for experiments like how many drops of water fit on a coin and the color changing fizzy reaction. They are great for fine motor practice, too! Add a few tablespoons of baking soda to your fake snow and stir. It will gradually “melt”. Pour a few drops of liquid watercolors into the snow. Add glitter, if desired. Use a pipette to squirt vinegar onto the spots of color. Watch what happens! Repeat over the entire surface of the snow. 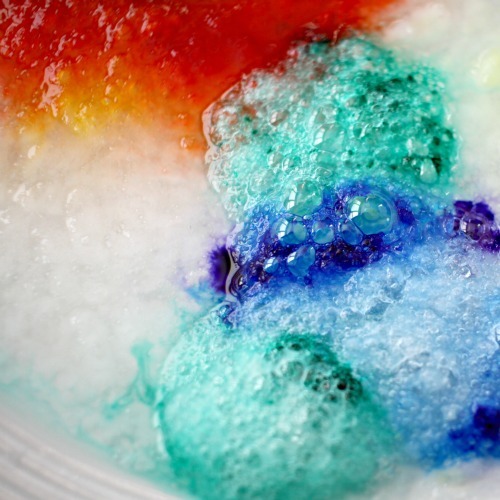 Watch how the colors fizz, bubble, and mix. At the end you will have a beautiful canvas full of fizzy colors! *For easy clean up, dump your fizzy snow in the trash, NOT down the sink! I know from experience that fake snow is excellent at clogging drains. 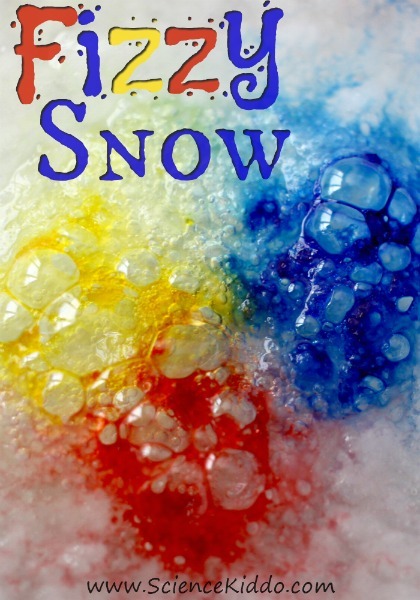 Making fizzy snow is an exciting twist on a classic chemical reaction between vinegar and baking soda. The bubbles you see are carbon dioxide gas that is produced when vinegar and baking soda mix together. The fake snow “melts” when you add baking soda because the water molecules would rather bond to baking soda than to sodium polyacrylate. This means the snow-like gel dissolves. 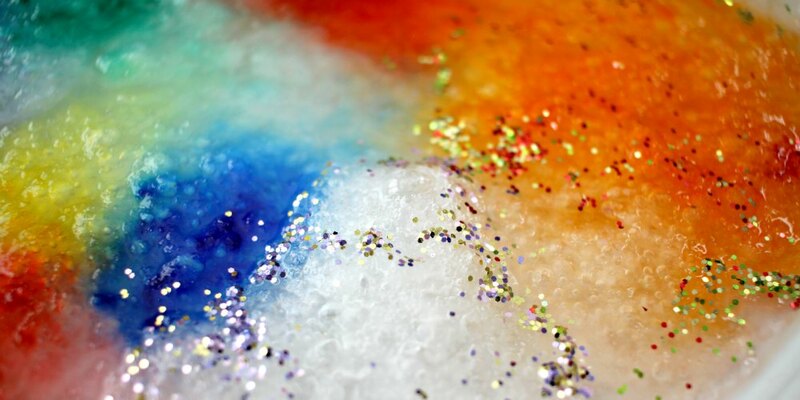 The more baking soda you add, the slushier your fake snow will be! When you complete this activity I would love to see your pictures of your beautiful works of art! Join us on the Science Kiddo Community Facebook Page to share! Off to find liquid water colours! My kids would love this! Thankfully, we are past the diaper stage, but we might have to ask a friend for one. Thanks for sharing at #made4kids!